Honey Custard with Roasted Strawberries | Naturally. With all the chaos and businesses that is happening right now, I’m packing and heading back to Illinois today. My uncle turned 70 yesterday and my grandmother planned a large family dinner, one of the first I’d be missing since I moved. While I love California, one of the hardest things still has been being so far away from all my family. I’ve been extremely blessed to have such a loving and supportive family, with all four of my grandparents still alive (but I know soon that won’t be the case-I try to be a realist about things). Even though I feel like I don’t have the time, I’m stepping away from the cookbook and work for 5 days because it felt like the right thing to do. So, a short post with a recipe from a beautiful new cookbook gracing my shelves. Todays’ recipe comes mainly in part from the lovely new cookbook, The Nourished Kitchen. If you follow this site, I’m sure by now you’ve already discovered Jenny’s site, Nourished Kitchen. She is a wealth of knowledge when it comes to traditional foods (from traditional recipes to raising chickens to sprouting grains (keep this handy when my book comes out, I didn’t talk about sprouted grain flour but she has the info you need!) Her site is chocked full of information on eating real foods. Have I sold you? If I have, I highly recommend The Nourished Kitchen cookbook. Not only is it beautiful with enticing recipes, it has the same level of valuable information from her site. Bring 2″ inches of water to a simmer in a pot that has a double boiler top or will fit a metal bowl. Place the heavy cream in the top bowl and scrape the vanilla bean into the cream and whisk. Place the bowl over the simmer water and cooking, stirring occasionally, until cream is warm. Add honey and continue to stir until dissolved. In a separate bowl, whisk egg yolks together. Vigorously whisk in 1-2 tablespoons of the heavy warm cream mixture at a time to temper the eggs. 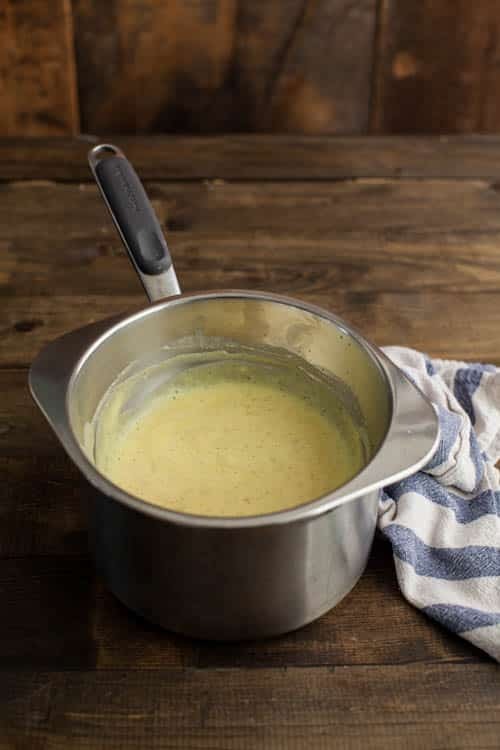 Pour the custard mixture back into the top bowl of the double boiler and continue to heat, stirring slowly, until the custard has thickened and coats the back of a wooden spoon, 10 minutes. Divide custard into two small bowls. Preheat heat oven to 400˚ and place the quartered strawberries in a roasting pan. 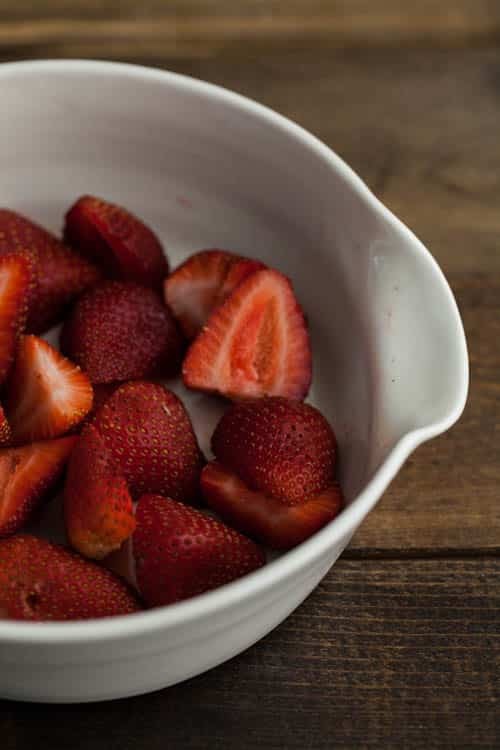 Drizzle honey over strawberries and bake for 15-20 minutes until strawberries are tender but still holding their shape. Remove and spoon strawberries over custard. *Custard can be served over warm custard or chilled custard. I prefer the consistency of the chilled custard and warm strawberry combination but you can serve with all chilled, all warm, or a mixture- it’s really up to you! This look so yummy! Love the idea of a honey custard. That custard looks so yummy Erin! Love the recipe! I can not think of anything more perfect!!! 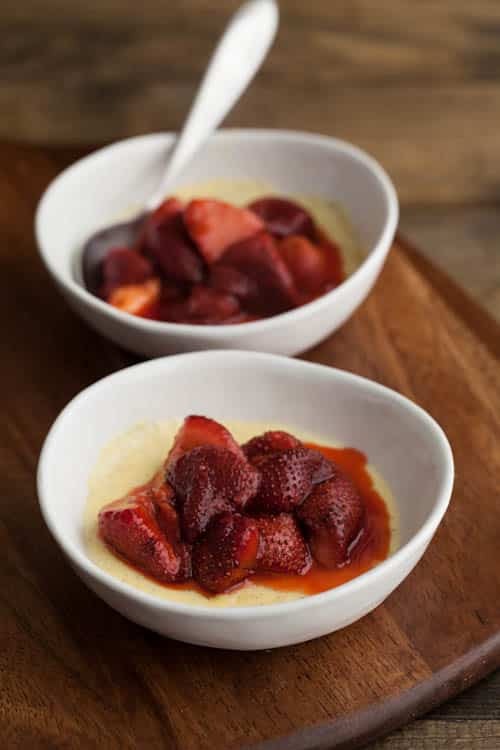 Honey custard sounds lovely, as do roasted strawberries – can only imagine how great they would taste together. 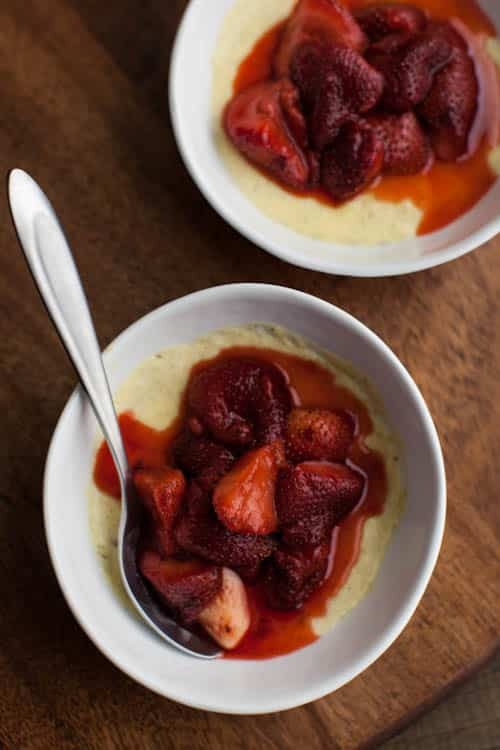 Such complimentary, simple flavors to highlight the best of both the custard and strawberries! Yum. Good for you for taking this time off!! Oh wow! I didn’t think there could be anything better than a perfectly ripe strawberry, but this might be! Hi Erin, you’re photographs are beautiful! Could you tell me what kind of honey you used? I know there are a few different types, and am curious about what kind you prefer. Hi Sarah- I used a local wildflower honey that had a nice floral hint but nothing too over-powering! Recipe says it serves 2, but then the instructions say to divide it into 4 bowls. I am wondering if I need to double it to serve 4? Is a serving 2 bowls for 1 person? Thanks! I divided the recipe in half and forgot to update the “four” to say “two.” If you want to serve 4, double the recipe! So excited to try this out! Thank you!! Good for you! I hope you got some much-needed time off. And, goodness. THIS. I always feel like family should come first, always, so good for you for sticking to your guns and taking the time off! Have fun! This custard sounds so lovely. Simple, yet so delicious. Oh. My. Dear. Gosh. I need this in my mouth. Right about now! Yum!